Hi Hurco Blog Readers. Mike Cope has been on the road quite a bit so I'm filling in as a guest writer for his blog. 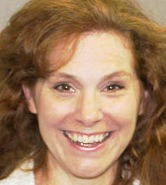 A little about me…my name is Maggie Smith and my official title at Hurco is Media Relations Manager. I’m the person in our marketing group who writes articles about our products, our company, and our customers. My background is journalism. I started as a reporter for a newspaper back when they were the main source of local news…before the internet. I’ve worked all of the media “channels” as they say in the biz (TV, radio, print, web), but primarily as a writer, editor, or reporter. Just like most writers, I read a lot. I read things other people find boring and tedious. I consume all of this information and distill it into little nuggets that I think might be useful in the future…maybe during a game of Trivial Pursuit or Jeopardy. Last week, I ran across The TOP SHOPS report and re-read it. The summary is 28 pages so this blog post just covers the information I think you might find interesting or helpful. To access the full report, click this link to go to the Top Shops Zone on Modern Machine Shop’s website. Steve Kline, Jr., the Research Analyst for Gardner Publishing (publishers of Modern Machine Shop and other trade magazines), started this report two years ago as a way for shops to compare themselves against other shops (a practice called benchmarking) using Key Performance Indicators (KPIs). 50% Job shops (independent shops that primarily perform short-run and other non-repeating work). 32% Contract shops (independent shops that primarily have contracts for repeating part numbers). 18% Captive organizations (an affiliate or subsidiary of a large corporation). The results of the survey compare the responses of those shops deemed “Top Performing Shops” to the group as a whole and to other shops. For this blog post, I simply compare the results between TOP SHOPS and Other Shops. What do TOP SHOPS do differently? The first significant difference I noticed in the report was the type of machines and machining strategies TOP SHOPS use compared to Other Shops…but the fact that I work for a machine tool builder might be responsible for my focus on this particular information. 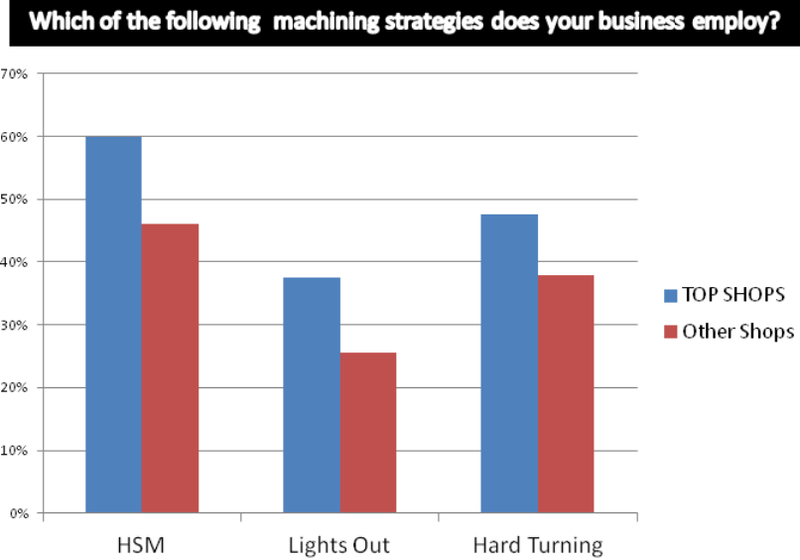 In answer to the survey question “Which of the following machining strategies does your business employ?” the comparison of results between the TOP SHOPS and other shops was fairly similar for all categories, except High Speed Machining, Lights Out Machining, and Hard Milling. 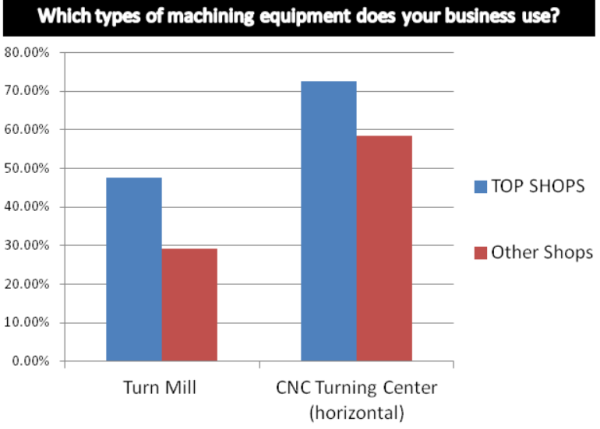 The next question in the Machining Technology section, “Which types of machining equipment does your business use?” provided similar results in all categories except Turning Centers and Turn Mill Multi-Tasking Machines. 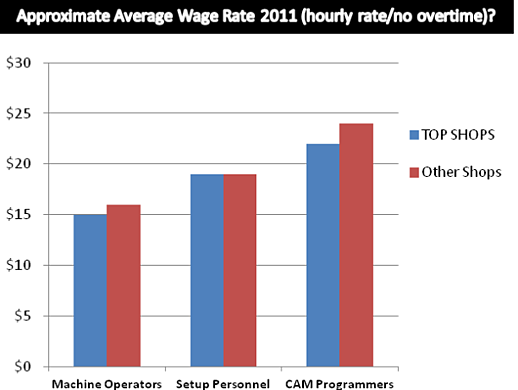 Do TOP SHOPS pay more? While the TOP SHOPS pay a slightly lower hourly wage on average than Other Shops, they offer more human resource initiatives that may provide employees with a career path and upward mobility. In the following chart, you’ll notice 85% of TOP SHOPS have an Annual Review and Raise Program while 65% of Other Shops report having such a program. 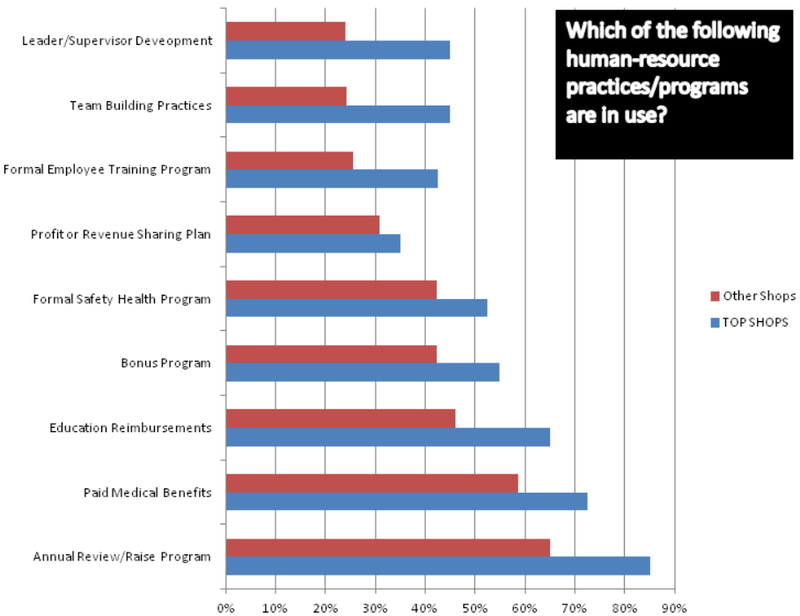 A higher percentage of the TOP SHOPS have programs for Education Reimbursements (65% vs 46.1%), Leader/Supervisor Development (45% vs 24.3%), Team Building Practices, Paid Medical Benefits, and a Formal Employee Training Program, than the Other Shops. This benchmarking study from Modern Machine Shop publisher Gardner Media will become even more valuable each year because you will be able to see trends year over year. My quick snapshot of the TOP SHOPS report in this posting was for the 2012 report, but Steve Kline and his research team are currently working on the 2013 report. While the 2012 report is packed with information, I think measuring the average amount of overtime would be a valuable addition to the results. I sent my suggestion to Steve and he might include that question in the next survey. If you think that would be an important metric, just post it in the comments section or send me an email (smithmag@hurco.com). Additionally, let us know if there is other information you would find valuable as a business owner or an employee.